Loch Morlich, complete with sandy beach! Aside from getting out in the hills (read more about that later) and some trail running Donna and I both wanted to get into the lochs to practice our open water swimming in preparation for the Triathlon in October. 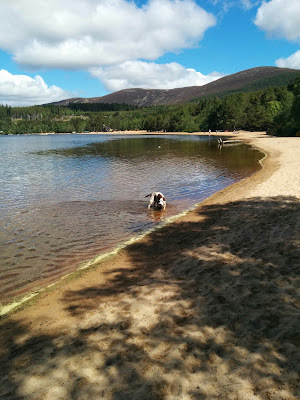 So two day's in to our break we packed up our families, the dog and our wetsuits and headed off to Loch Morlich, about a 20 minute drive from Newtonmore and 5 minutes from Aviemore) for a swim! Monty wasn't quite as bothered by the cold water as we were! 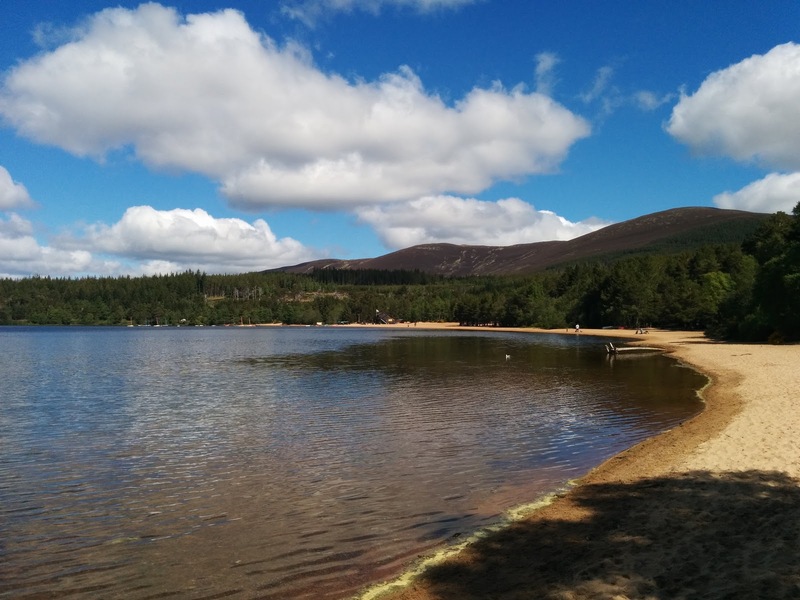 Loch Morlich lies at the foot of the Cairngorm mountains and is a stunning place to be either on or off the water and also boasts a kilometer of sandy beach - ideal for our daughter and dog to play on while we swam. There is also a circular track around the loch for cycling or walking - a circuit that we'd walked the day before with Isabelle in the carrier. 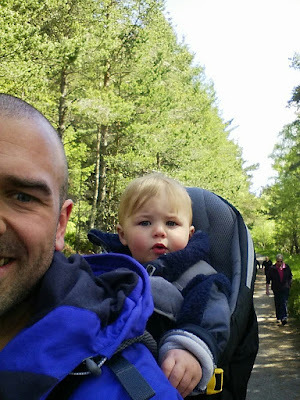 We'd both had to purchase tri-suitable wetsuits for the upcoming triathlon as the swim was to be an open water so this was a good test for both them and us. Donna went for an Orca TRN suit and I, on reading some reviews about the mens version, opted for a Zoot Z Force 3. Suitably kitted out in our wetsuits we walked gingerly into the loch - man it was cold - and there was nothing for it but to jump in and swim. The water in Loch Morlich is dark, really dark, and you can see the bottom and dead branches for only 15m or so before there's nothing below you but blackness - to start with it's quite disconcerting and it's going to take Donna a few attempts to get over the slight fear factor of not knowing what lies below (nothing in truth although I probably didn't help by telling her to watch out for Pike as we set off!). 50 meters or so out I stopped as mu face was almost numb from swimming front crawl and switched to breaststroke. I also realised that I hadn't started the timer on my watch - doh! We swam out to the first buoy (about 100m or so) and then on to a slightly further buoy which we swam around before heading back to the shore and a cup of coffee and cake which was greatly appreciated. Not the longest swim, or the fastest but a good introduction to open water swimming, in a beautiful location, and the wetsuits performed really well and felt easy to swim in thankfully.